In the previous article, I wrote about gueuze, one of the best Belgian beers, known for its refermentation in bottles like champagne. However, in the past it was often also sold in barrels. 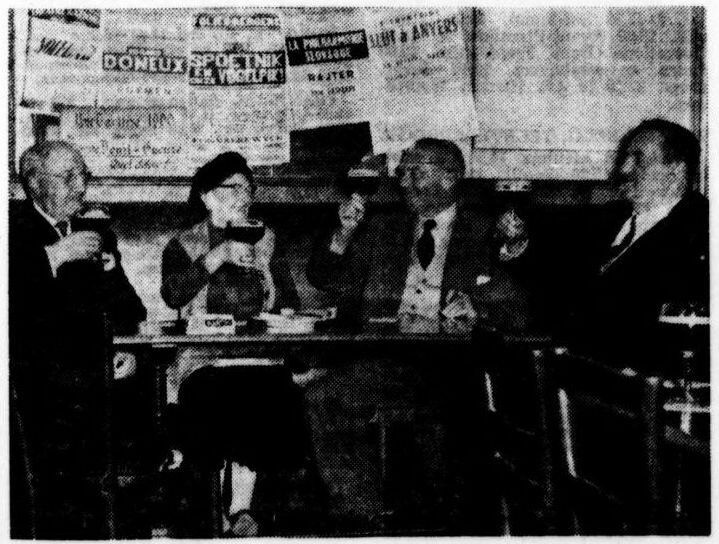 For instance, in 1909 one Edmond Mineur described an old man from Brussels who every morning invariably had a gueuze from cask, but in the evening closed his day with a few good pints of gueuze from bottle, smoking his pipe. So what was gueuze actually? And why is it a bottled beer almost by definition today? I found a few surprising answers… and they have everything to do with the trade of gueuze blender itself. 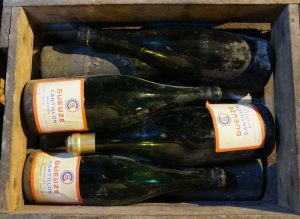 Like we saw last time, in the 19th century gueuze was the name of old, unsweetened lambic that was seen as the best and most expensive variety. According to a certain Paul van Cauwenberge, who wrote a few articles about lambic in 1928, the fashion of bottling gueuze originated around 1890, when a few brewers started to put this quality beer into champagne bottles, with a nicely foaming beer as a result. A good example is given by the Paris-based magazine Le Panthéon de l’industrie, which in 1894 paid a visit to the La Couronne brewery, owned by the Vander Borght brothers on Rue d’Anderlecht in Brussels. Here lambic was brewed of escourgeon malt and unmalted wheat, the wort was boiled for 6 to 7 hours, and by blending lambic and the weaker March beer they made faro. So far nothing unusual. The lambic was aged for two to three years, after which a mellow beer with an unmistakable bouquet had formed. The Vander Borght brewery, where in 1894 only 5% of its lambic was sold as gueuze. Source: Les cahiers de la fonderie, 1990. However: they also made an extra fine lambic, called ‘lambic gueuze’. For this, they selected their best lambics. A very narrow selection: only about 5% was deemed good enough! In the end, the gueuze-lambic would age for two years in barrels and five years in the bottle. The French journalist was impressed. ‘This marvellous brew… to us was as tasty, as captivating and original as a Burgundy grand cru’. La Couronne was no small enterprise: it had about 8.000 barrels with ageing lambic. Also, in 1890 for instance they supplied the Brussels hospital with 53,500 litres of faro. In the end, the company existed well into the 1950s. But despite the fact that at that time the best gueuze was in bottles, there was also a lot of gueuze sold in barrels. And lambic in bottles, as we’ve seen in the previous article. So how did we end up with the current situation, where gueuze is almost exclusively bottled, and almost no ordinary lambic is on the market, let alone in bottles? 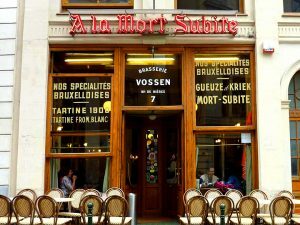 A fascinating account is given by Albert Vossen (1897-1978), who for years owned the famous Brussels café A la Mort Subite. He also led the accompanying brewery in Rue des Capucins that was active until 1959, when production was outsourced to De Keersmaeker brewery in the village of Kobbegem. For those who don’t know this café: A la Mort Subite is a monument of beer culture, with its Jugendstil interior. According to the old family tale, the establishment owes it creepy name to the dice game that was often played there, where the abrupt end of a game was called a ‘sudden death’. 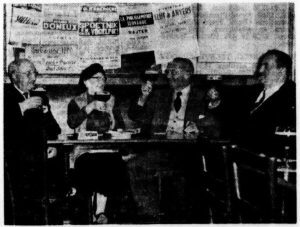 Mort Subite’s Albert Vossen (right) with three of his regulars, all equally devoted to gueuze-lambic. Source: De Tijd 1-2-1958. Vossen had experienced it all from close by, as a pub owner and a brewer. ‘Before the 1914 war, the beer blender was a happy man’, he writes. He could easily sell his blends in the form of faro, sweet lambic, gueuze in barrels and gueuze in bottles. Faro was, as mentioned above, a blend of lambic at 5.5 to 6% ABV and March beer of 3%, sweetened with sugar. Sweet lambic was also sweetened, while gueuze in barrels was dry and non-foaming. Gueuze in bottles: it only has been mainstream for 100 years. Thus, blending lambic already called for a lot of skill, but when its bottled variety gained in popularity, the required craftsmanship only increased. Before that, there was room for tinkering. Also, the bottles gave the additional problem that young beer needed to be added to get refermentation going. After all, lambic that had been aged for two or three years, had reached such a level of attenuation that 90% of the bottles would remain completely still if it wasn’t cut with some fresh beer, according to Vossen. And even then they had to be careful: too much young beer gave too much refermentation, which during warm summers would yield exploding bottles as a result. During the hot summer of 1949 2 to 3 million bottles were said to have exploded in and around Brussels. All-in all, only now I’m starting to really understand the history of lambic. The First World War is the watershed: before, it was mainly faro and lambic in barrels, and after the emphasis was on gueuze in bottles, and the barrels disappeared. After the Second World War its taste drifted in the direction of plain and sweet, with the so-called ‘capsulekesgeuze’ and the many fruit beers, but that’s another story. The wonderful gueuze that we cherish so much today is not a Medieval beer, as some people still claim. In reality, gueuze as we know it now, sparkling, bottled and the product of careful blending, is scarcely 130 years old and only became mainstream exactly one century ago. Edmond Mineur, ‘A propos du lambic’, in: Le petit journal du brasseur, volume 1909, p. 466-467 (for this and other articles used here, see http://www.lambic.info/Bibliography). Paul van Cauwenberge, ‘La fabrication du lambic’, in: Le petit journal du brasseur, volume 1928, p. 267-269. E. Robert, ‘Les grandes maisons belges. Le lambic, le faro, le kroon’s bier’, in: Le Panthéon de l’industrie, volume 20 (1894), p. 183. Thierry Delplancq, ‘Les brasseurs de lambic. Données historiques et géographiques (XVIIIe S. – XXe S.) (1)’, in: Archives et bibliothèques de Belgique, deel 67 (1996), nr. 1-4, p. 257-320, here p. 285. Albert Vossen, ‘Champagne – Gueuze’, in: Fermentatio, nr. 1 (1954), p. 3-24. Jules Cartuyvels en Charles Stammer, Traité complet théorique et pratique de la fabrication de la bière et du malt, Brussels/Liège 1879, p. 420. Vossen, ‘Champagne – Gueuze’, p. 18-19. Is anyone aging for 5 years these days?